For those of us over the age of 40, reviewing today’s Bible study software can cause conflicting emotions. It’s exciting to learn all of the capabilities of these great time-saving tools, but it is sometimes difficult to keep oneself from thinking, “I wish this had been available back when I was a student staying up all night to write papers.” Then I think, “Just having a computer would have been nice.” The temptation to envy today’s students is strong. 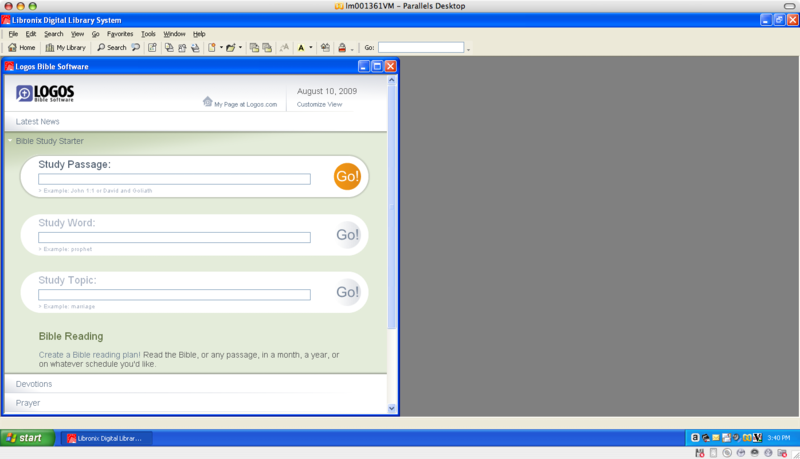 One of the premier Bible study software tools available today is Logos. Logos is perhaps best known for its digital library resources, but it has also made great strides in its original language research capabilities. In fact, at the present time, it has one original language capability that no other Bible study software program has. I will get to this feature below. For this review, I am looking at Logos Scholar’s Library Gold. Logos has several base packages, and Logos Scholar’s Library Gold is their top of the line package. My copy, the Mac version of Scholar’s Library Gold, was sent gratis by Phil Gons at Logos. With the Mac version, I had the option of installing either the Mac version, the PC version, or both. For the sake of comparison I loaded both the Mac and PC versions of Scholar’s Library Gold. I loaded the Mac version directly on to my MacBook Pro, and then I loaded the PC version using my Parallels Desktop software. Installation involves three basic steps. First, you load the Libronix Digital Library System. Second, you activate the product. Third, you install your digital books. One important note: At the time I installed this software, I downloaded installation instructions from the Logos website. I discovered during installation that some of the installation procedures had changed, but the online instructions had not been updated. An email to Logos quickly helped me get past the discrepancy, but Logos should update their online instructions. With the Mac version, the installation of Libronix was fast. Activation took a bit more time. I had to get this process started by going into my Mac applications folder and opening the program manually, although the instructions seemed to indicate that this step would automatically proceed from the first. The third step is the time-consuming step. With the Scholar’s Gold Library in particular, there are a lot of books to load. I was able to select the ones I wanted before loading them. This takes additional time because you have to select or unselect each book individually. It would speed up the process if there were check boxes for particular groups of books. For example, all of the 77 commentaries in the Pulpit Commentary could have one master select box that you could choose rather than having to select or unselect each individual volume in the series. After choosing the books I wanted, I began the process of loading them onto the computer. I didn’t time the process to the minute, but it took almost 45 minutes to load everything. The final step in the online instructions asks you to write down your Customer ID and Confirmation Code and then perform a license backup. The online instructions for both of these processes were inaccurate. To get your Customer ID and Confirmation Code, you do not navigate to Help>About Libronix DLS as instructed. Instead, you navigate to Libronix DLS>About Libronix DLS. I’ve also been told by Logos that it is no longer necessary to do a license backup. Apparently, that is now done on their server. Again, the online instructions need to be updated to reflect these changes. With the Logos Scholar’s Library Gold for Mac disc, you can also load the PC version if you have the software necessary to run Windows applications on a Mac. I have Parallels Desktop on my Mac, so installing the PC version was an option. But why would anyone want to do this in the first place? The main reason is that the PC version has features that are not yet available on the Mac version. I will explain the differences in more detail below. To install the PC version on a Mac, you must first open Parallels Desktop (or another software program that allows you to run PC applications). At this point, all that is necessary is to install the disc and follow the on-screen instructions. The Install Shield Wizard walks you through the process. If you install both versions, you will have to activate both versions. There is also a way to save hard drive space by sharing the resources folder across Parallels, but I decided to load the whole thing twice. Those who own a PC simply need to purchase the PC version of the software and load it directly onto their PC. Scholar’s Library Gold combines Logos’ well known digital library resources with original language research tools. It would take several pages merely to list the available features. A list of 100 features is available here at the Logos website. One feature that is unique to Logos is its Syntax Search capabilities. At the present time, no other Bible study software has this feature. 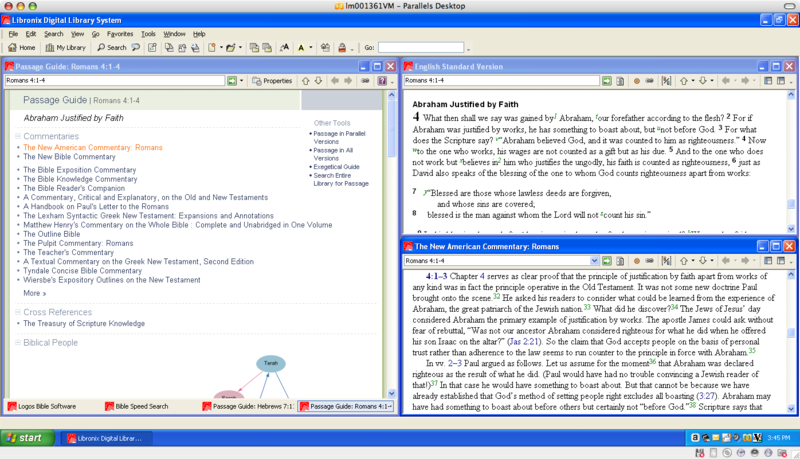 All of the top Bible study software programs (Logos, Accordance, BibleWorks) have morphologically tagged databases that allow for all manner of detailed word-based searches. In addition to this, Logos also has syntactically tagged databases that allow the user to search at the next structural level. This is a very valuable feature for those doing in-depth study of the original texts. In fact, I would suggest that it is the most valuable feature in the new Logos software. I should note that at the present time this feature is available only on the PC version of Scholar’s Library Gold. It is not yet available on the Mac version. The number of resources available on Scholar’s Library Gold is impressive. It contains more than 700 titles. A complete list of titles is available on the website here. Among other things, it contains the entire ten-volume Theological Dictionary of the New Testament, the 12 existing volumes in the New International Greek Testament Commentary series, and the 31 existing volumes in the New American Commentary series. I am a long-time BibleWorks user, and before receiving this review copy, I had never used Logos. In order to get my bearings, I watched several of the basic instructional videos at the Logos website. They have over seventy such videos, ranging from basic to advanced. These videos are for the PC version only. There are nineteen training videos for the Mac version. Here is the PC version homepage. Here is the Mac version homepage. When you do a search for any of these, you simply enter the passage, word, or topic and click on the “Go” button. At this point, the software searches through every resource you have and organizes it into an easily navigated list. Searches do, however, take some time. This is one of the drawbacks to having such a large amount of resources. 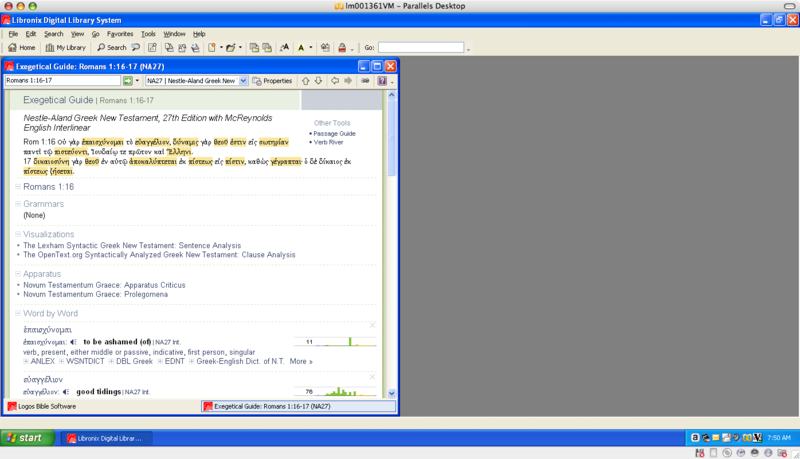 As an example, with the PC version open, I did a passage search for Romans 4:1-4, and it took 28 seconds to complete. A word search for “priest” took over two minutes. A topic search of the entire library for “marriage” took over a minute and a half. Now, compared to the amount of time it would take to manually go through this many resources, those numbers are insignificant, but users need to know that they should not expect anything like Google’s speed. My results with the Mac version were different. It took about ten seconds for a passage search on Romans 4:1-4, an improvement over the PC version. The word search for “priest” and the topic search for “marriage” were less successful, however. After five minutes of waiting on the word search, I simply cancelled the search. The same thing happened with the topic search. I tried both a second time later, but the results were the same. I eventually had to cancel the searches because they weren’t completing. When you do a passage search from the homepage, a passage guide is generated. The user can also open an Exegetical Guide on any particular passage. This tool helpfully analyzes the features of the original language text. As mentioned above, one of the helpful sections of the Passage Guide is a new module called Biblical People. 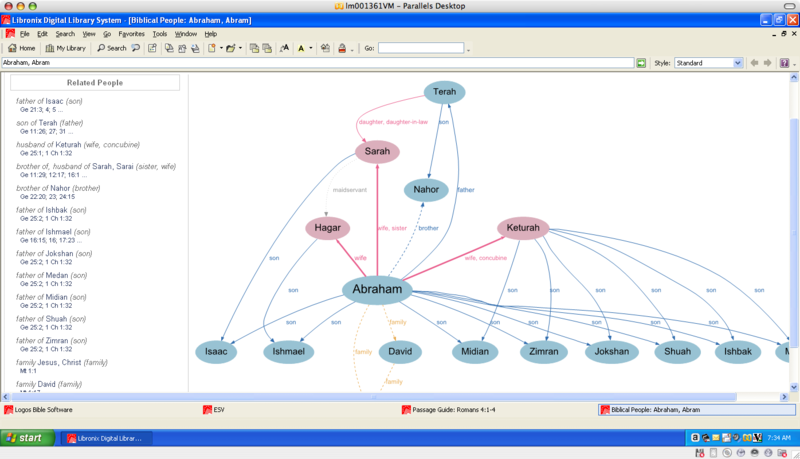 If your passage contains the name of a biblical person, this chart diagrams that person’s relations with other biblical people. As far as I know, this is a feature unique to Logos. Logos Scholar’s Library Gold puts a large amount of searchable resources at the user’s fingertips. The number of resources that can be added to the base packages is amazing and always growing. In terms of digital libraries, Logos sets the standard. I doubt that any software will ever be able to convince me to read an entire book on my computer (It gives me a headache to do so), but the ability to quickly find things in a large number of reference works is an invaluable time-saving tool. Overall, it is a relatively easy to learn and use software program. The Gold level should prove especially helpful to Pastors in the preparation of sermons. The number of resources available on Scholar’s Library Gold seems to be a mixed blessing. On the one hand, there is a huge library of searchable texts here. On the other hand, the very existence of such a large number of texts slows down the searches. Again, compared to a manual search in bound volumes, this slow down is virtually irrelevant, but for those used to the speed of a Google search, it seems bogged down at times. An additional related issue is the large number of resources that a user may not need or want. I would estimate that at least half of the book resources available in Scholar’s Library Gold are resources that I would never use. For those who do not want to pay the full retail price of Scholar’s Library Gold, it may be better to buy one of the more basic packages and then simply add those resources that will be used regularly. Speaking of the retail price, Scholar’s Library Gold is not cheap. The retail price for either the PC or Mac version is $1379.95. There are other packages, however, that are less expensive. Information on each of these is available at the Logos website. Logos offers a 25% discount on their base packages through a variety of channels. They also have academic pricing for faculty, staff, and students with discounts ranging from 30-50% off the retail price of the base packages. More information is available at their website here. As I mentioned in the section on installation, there are a number of steps involved. It seems like this process could be streamlined a bit more. In addition, it is worth repeating that the online instructions should match the actual installation process, especially if no instructions are included with the discs themselves. Getting help for Logos is not difficult. Both online and phone help is easy. The tutorial videos are also very helpful for the PC version of the software. Hopefully, Logos will soon post more instructional videos for the Mac version. Regarding the difference between the Mac version and the PC version, I would have to say that if a person owns a Mac, they would still be better off at this point using a program like Parallels Desktop to load the PC version. The Mac version simply does not have as many features, and at least in my trial run of search tests, did not work as well. The word and topic searches seemed to freeze. The most helpful features of Logos for someone like myself are the syntax search feature and the searchable versions of the entire Theological Dictionary of the New Testament, the New International Greek Testament Commentary series, and the New American Commentary series. I don’t see Logos replacing BibleWorks in my own study, but it is a very helpful supplement. For more information on Logos, visit the website here.